It's good shtuff, thish red, ishn't it? The more I look, the more there is to see! Possibly even better without the manipulation? All the gear & no idea. This is a very interesting shot like the other previous ones. By my opinion the picture was rotated by 90° CW and the wine was frozen into the glass. Is my hint correct? I am totally confused, no ps? Upright glass / wonky wine? HOW??? Using a traditional film camera I used the double-exposition method. I know that the K20 doesn't know it, but I'm not sure in this capability of the K7 that was used by you. I am sure in that your camera was fixed to the board with all other items and you moved the all items together. The wine was shot when you rotated them to right (CW) by about 30 degrees. 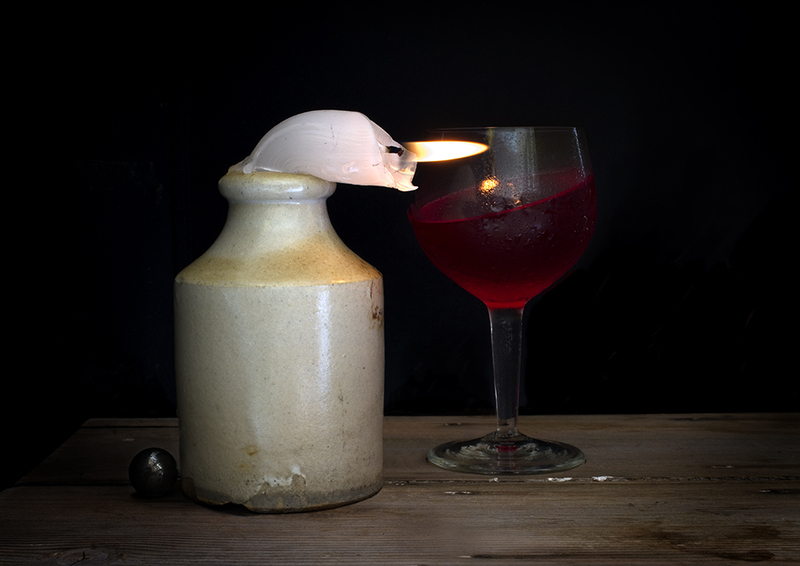 I have only a problem with the wine, because when you shot the candle's flame then the all items were rotated to left (CCW) by 90 degrees. But where was the wine then? OK, I looked at your shot closer. I see that the candle was in this position under the preparing, because the candle flame melted the wax over it. My guess is that you fixed all items, the camera and the lighting to the board and you moved smoothly to left or round. The airflow layed down the flame. K20D...ist DS ,DA18/55,DA16/45.DA* 50/135,"A"1.7 50MM..."A" 70/210..M 50mm f2...Tamron 90mm macro,28/300 Tamron,200/500 Tamron 6.9....A Pentax DA*300... Sigma10/20,FA31mm 1.8 Ltd*********,FA 77mm Ltd! Wine? jelly set at this angle? Congratulations Larry! The rest is all down to super glue. Then my first attempt was correct. You took it in portrait format and rotated to landscape (CW 90°), but the wine wasn't frozen but it was a gel. Your question about rotating confounded me. You gave me an idea with this composition. I have only think out that where and when could I realize it. I am I looking forward with interest for your more complex 'impossible' still-life composition.